Phumzile Mlambo-Ngcuka said in an interview and a speech ahead of the Commission on the Status of Women’s annual meeting starting on Monday that sanitation, clean water, good roads, affordable internet service and use of mobile phones to transfer money and pay bills are critical to changing women’s lives. She pointed to affordable internet service and the use of “mobile money” through mobile phones that are changing the lives of women in Kenya in the same way that microcredit – small loans – has enabled hundreds of thousands of women in developing countries to start businesses. Ms. Mlambo-Ngcuka said improving infrastructure to provide clean water means that girls don’t have to walk miles to get water from a river and boil it. In Rwanda, Ms. Mlambo-Ngcuka said drones are being used to deliver medicine to rural areas, and in West Africa, drones are being used to oversee fields and sprinkle organic material to kill pests. She also said blockchain technology – storing digital information about transactions in a public database – can be used to deliver services to displaced people. 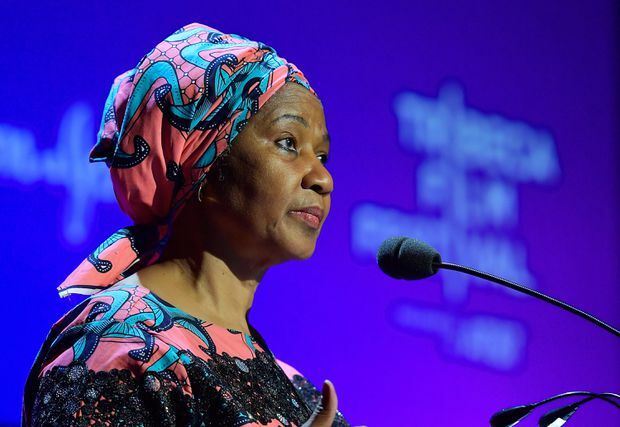 She said the biggest challenge in implementing the UN goal of achieving gender equality by 2030 is the need to accelerate the pace and scale-up action. The debate on the commission’s final document is still underway and Ms. Mlambo-Ngcuka said among the issues still being discussed are the affordability of infrastructure projects and how can they be financed, and the transfer of technology so that those in relatively agrarian countries can leapfrog to the internet era.